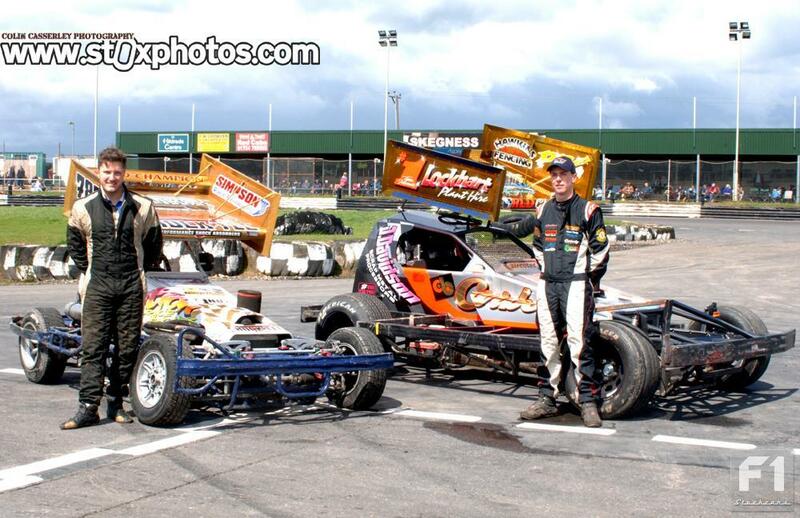 Double gold – the F2 World Champion James Rygor with F1 World Champion Tom Harris before the UK Open weekend. 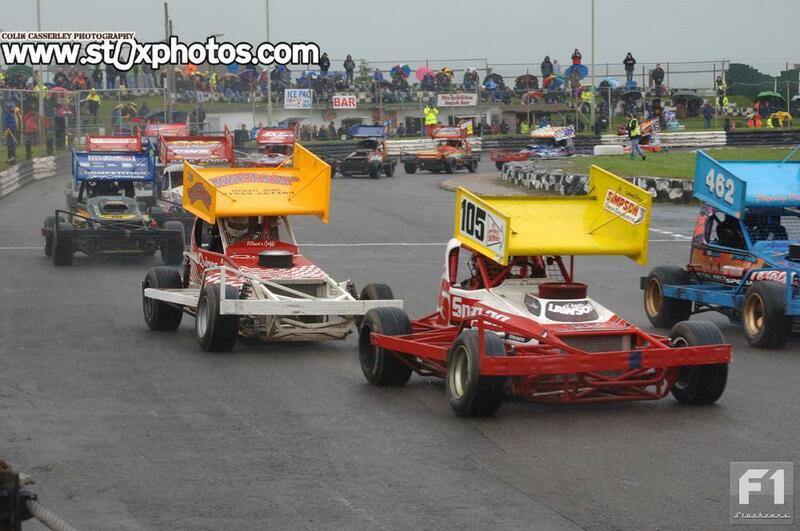 37 Formula one stock cars gathered at a rather wet and windy Skegness stadium. Saturday was all about gathering World Championship qualifying points and scoring points to gain a better grid position for Sundays UK Open championship. 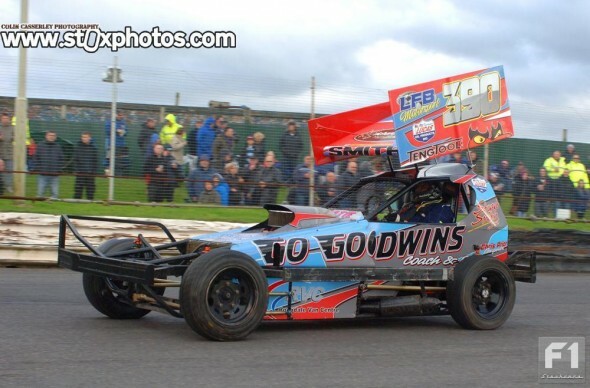 No shortage of stars and superstars around the pits but most fans seemed to have eyes for only one, as 2007 World Champion and 2009 National Series Shootout Champion Stuart Smith Jnr 390 had chosen this meeting for his return to the tracks. Heat one gathered 18 hopefuls. 220 Will Hunter led them away but a self inflicted spin left an opening for 195 Dean Whitwell who opened up a substantial lead. Stuart Smith Jnr showed little signs of rust leaving the other stars behind but looked to have his work cut out to catch a rapid Luke Davidson 464. 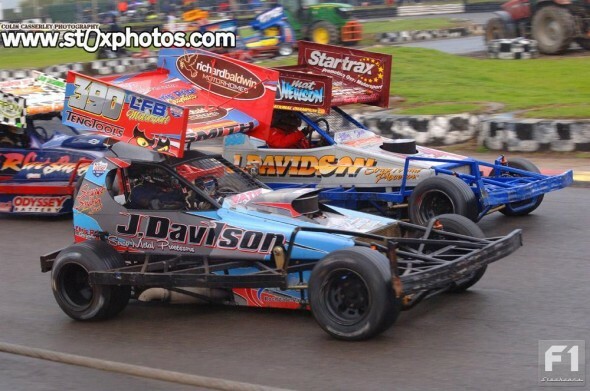 Before 390 could close the gap on 464 he had to do battle with the superstars as both 16 Matt “Mad Dog” Newson and 217 Lee Fairhurst began to put him under pressure. Stu Smith made his return to racing. 390 refused to give way and a back straight tangle saw 16 half spin and Fairhurst 217 give the Armco a severe bashing. The delay to 390 took the pressure off Luke 464 and he reeled in 195 Dean Whitwell with 3 laps to go for a comfortable victory, Whitwell held on for a well deserved second while John Dowson 94 put his early season troubles behind him with a solid third place. 19 made it on track for heat two but 434 Ivan Pritchard returned to the pits before racing commenced. Colin Goodswen 372 and Paul Carter 300 charged off at the front, but interest lay further down the field as Rob Speak 318 and World Champion Tom Harris decided to fight over the same piece of track. Speak has in some fans eyes had the edge over Harris in the early weeks of the season but others had pointed to his advantageous star grade start position. Rob Speak passing Tom Harris. 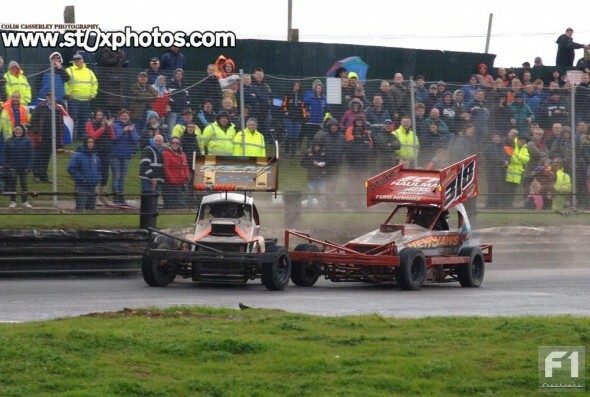 With Speak now also starting with the Superstars the playing field was a little flatter and they spent several laps exchanging hits until yellow flags came out to rescue 287 Sean Willis whose broken motor was parked in the fence on the home straight. Goodswen 372 led the restart from 41,174,172 and star men Paul Harrison 2 and 259 Paul Hines. 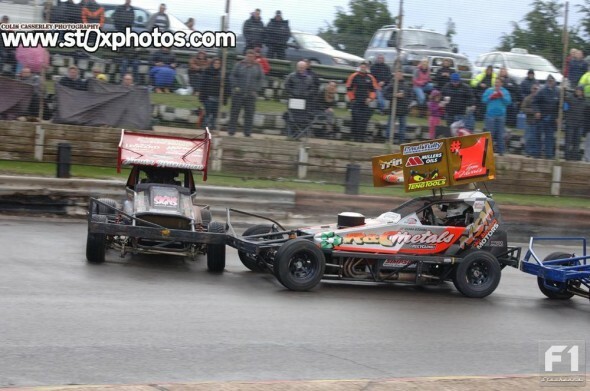 Speak and Harris continued their scrap until Harris lost time getting into a tangle with the 41 car of Robert Broome. Up front with five laps to go the Pauls, Harrison and Hines were now in charge with the 259 car looking the fastest and likely to launch Harrison on the last bend. Last time down the back straight and Harrison went for the go slow defensive strategy but Hines still managed to squeeze past for his first trophy of the weekend. Ivan Pritchard 434 made the consolation grid along with 16 others for what was a pretty slow race on a rather wet track. This race proved to be a pretty straightforward win for Dan Johnson 4 with the only incident of note seeing the 217 car of Lee Fairhurst being well and truly slammed into the fence in turn 2 by Paul Carter 300. 217 managed to crawl off to the infield and post race spent the next 90 minutes grinding and welding to get the car fit to run in the GN. The track was almost dry by the time 26 rather damp drivers gridded for the meeting final. Alex Wass 283 and the undergraded Goodswen 372 contested the lead. Speak 318 and Hitman Harris 1 were on a charge from the back and they certainly needed to charge as 259 Paul Hines had broken away from the red grade and was rapidly closing on the leaders. Scott Davids on the receiving end. Harris got in front of Speak, and Goodswen retired with a flat tyre before proceedings were halted by yellow flags required to rescue Alex Wass 283 and Chris Bonner 105 who were just two of several cars who had taken a tour of the fence in turn two. 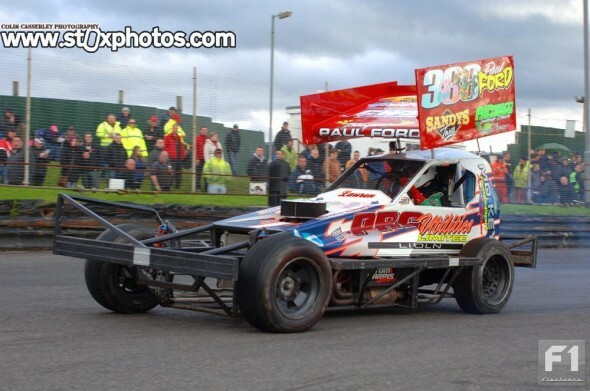 The restart was led off by Scott Davids 462 who always seems to save his best tarmac performances for visits to Skegness. 434 Pritchard was behind Davids with the rapid Progress Windows car off Hines 259 in third. Things got aggressive as 434 spanked Davids in turn 2 to take the lead while Speak also used turn two to put in a big hit on Harris but it was insufficient to shake the Hitman off his tail. As the halfway flag was shown Hines muscled his way past Pritchard to take the lead and with 6 laps to go Harris barged past Speak and pulled away. 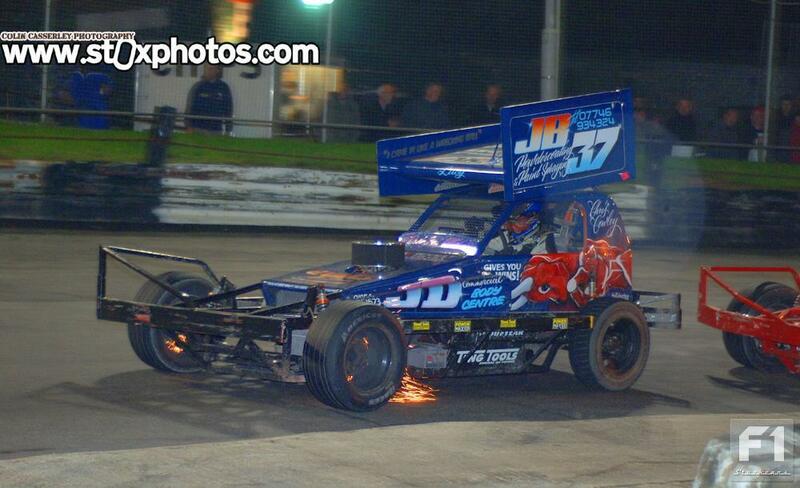 Chris Cowley making the sparks fly. The cars remained spaced out for the remaining five laps with the fans on the home straight “deafened” by the noise from the Team Hines posse as they cheered their man to the flag. The 434 car crossed the line second but was later removed the result for a technical infringement, leaving Harris and Speak to scoop the minor podium places. 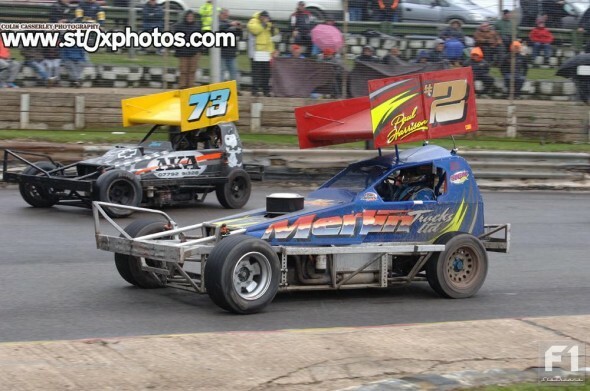 Following some more entertaining events from the National Mini-Stox and F2 stock cars, 25 made it out on track for the Grand National. No white tops in this race so Goodswen 372 had no problems charging off from the green into an early lead, things were also made a little easier for Goodswen when most of the blue grade decided to park themselves in a random manner up against the fence in turn two. 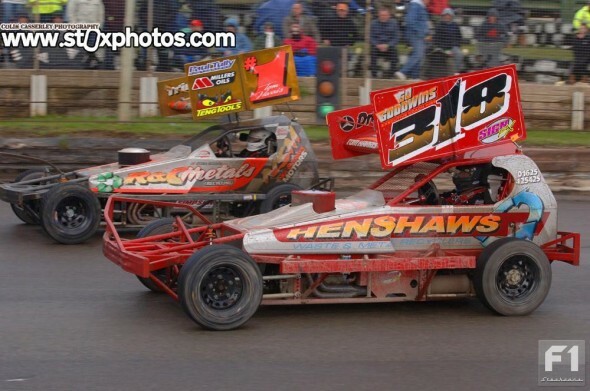 Main victims of this crunch were Davidson 464 and crowd favourite 45 Nigel Harrhy and yellow flags were required to remove the cars to the infield, 464 was relatively unscathed but the 45 car had substantial front end damage and would be in need of lots of TLC before Sunday’s events. Frankie getting it sideways, courtesy of Tom. 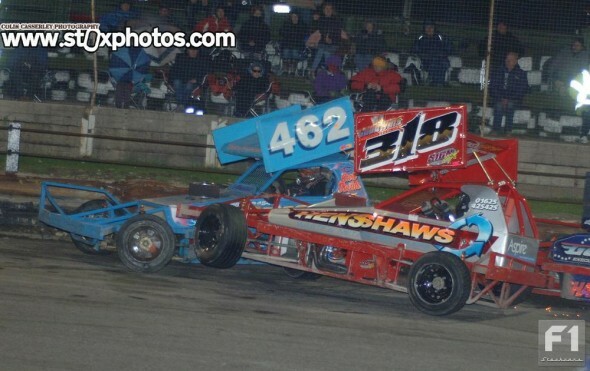 Goodswen led the restart while fans attention was divided between a Smith 390 v Harrison 2 scrap and a little further back a skirmish between Speak 318 and Fairhurst 217. 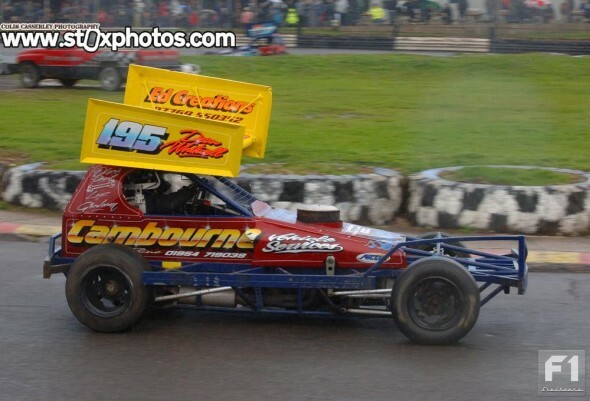 Hitman Harris was well on the pace but lost time getting involved in a bit of bumper action with Frankie Wainman Jnr 515. Whilst all this was going on a driver who was not even in the top six at the restart Paul Ford 388 found a whole lot more pace and outpaced Goodswen down the back straight on the last lap to record his first victory from star grade.372 Goodswen held on for second in front of Harrison 2 and Stuart Smith Jnr who finished his evening showing enough pace to suggest that it would not be too long before he was collecting major trophies. Harris and Speak do battle.